Maybe you don’t WANT an auction theme. It’s not your style. Maybe it seems like too much work. But still, the idea of nothing on the gala tables or silent auction areas seems UNfestive. I worked at three auctions this past weekend. Two of them were for schools and one for a nonprofit. One of the schools utilized a tactic I’ve seen often used at nonprofit galas that didn’t have a specific theme. The school decorated the tables with glass beads in colors befitting of their theme (gold, in that case). To put this in perspective, the school calls their event their “gala,” without anything more thematic than that. 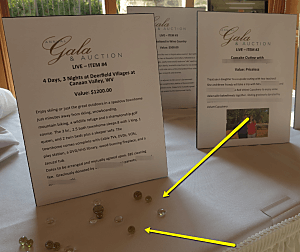 I’ve seen beads used on the silent auction tables, highboy cocktail tables, gala tables, etc. An internet search on “glass marbles for table decoration” and “glass beads for decor” yielded lots of options. 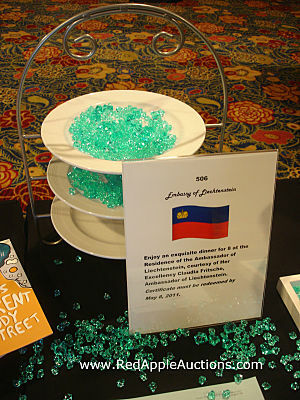 I’ve included a few photos on this page from events that used glass beads in varying degrees. They might have used them as the only decor element, or in moderation with other decor ideas, too. Decor ideas are one of those subjects that is easiest shown via photos. You can describe an idea … or just show it. So to that end, a few months ago I pulled together hundreds of photos to show you thematic ideas that you can use at your gala. It’s categorized by themes and subjects. There’s a workbook and DVD … the DVD is what’s critical. 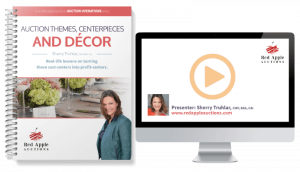 Use the workbook to take notes as I talk through the ideas in the DVD. 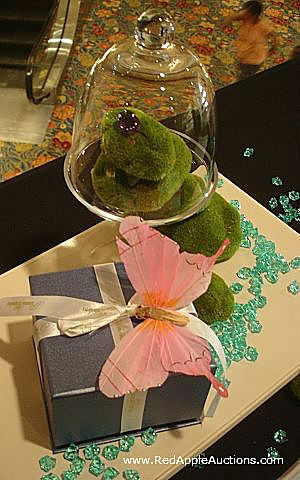 Click to learn more about Creative Auction Themes, Centerpieces, and Decor.